On October 5, 2018, the U.S. Food and Drug Administration (FDA) approved the administration of the Gardasil 9 vaccine for women and men between the ages of 28-45 years. Previously the vaccine was indicated for individuals up to the age of 27 years. "Gardasil 9 prevents certain cancers and diseases caused by the nine HPV types covered by the vaccine". Human Papilloma Virus (HPV) can cause head and neck cancer in men and women. It is the cause of most oropharyngeal cancers in United States. These cancers and their treatment may lead to trismus (limited mouth opening) and dysphagia (difficulty swallowing). The expansion in vaccination ages follows a study in which 3,2000 women between the ages 27-45 years were followed for approximately 3.5 years and it was found that Gardasil was 88% effective in preventing certain HPV related infections and cancers. The results were inferred to apply to men as well. Trismus, or restriction to mouth opening, has many implications including difficulty speaking, eating, maintaining oral hygiene, receiving dental procedures and may even affect intubation. Typical measure of mouth opening is 50 mm and highly correlated to body size. An opening of 35mm or less is considered trismus. Trismus is preventable and treatable by engaging in exercise therapy and treatment using jaw motion rehab systems such as the OraStretch® press. HPV is the most prevalent sexually transmitted virus. The best screening for HPV related oral cancer is by a medical or dental professional. However there are signs and symptoms that the individual can monitor. 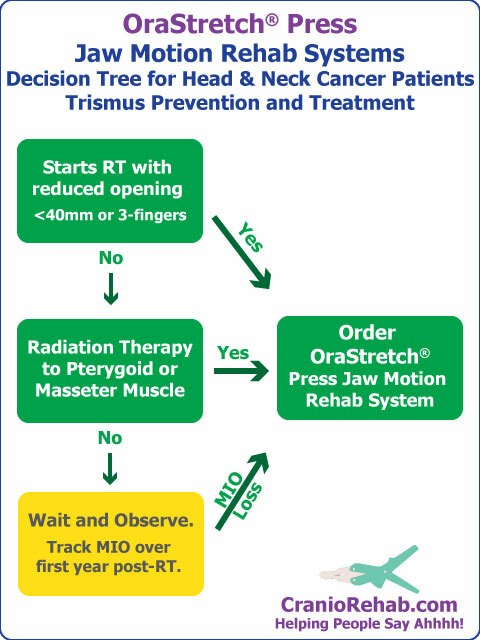 This study assesses the negative impact of trismus (restricted mouth opening) on head and neck cancer patients daily life activities. 6-12 months post-treatment trismus was found to impact quality of life with decreased mouth opening, jaw related problems, eating limitations, muscular tension, dry mouth, swallowing and pain as well as anxiety and depression both pre- and post-treatment. At the 2016 national ASHA convention, we presented on "Trismus Prevention and Treatment for Head & Neck for Cancer and Radiation Patients." Here we provide a copy of the slides for the presentaion and the handout from the session. What is included with the TheraBite System? An overview of the device, its parts, and what they do. 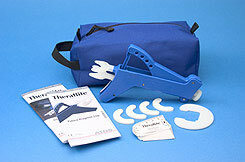 Learn more about what is included in the TheraBite jaw motion rehab system, including parts and their purposes. A new study shows that the HPV vaccine may reduce the risk of HPV-related disease. New study on increases in throat cancers from HPV. A new study estimates that oral and throat cancers have increased by 325% from 1998 to 2004, even as smoking has decreased. Doctors connect the increase to HPV, the virus that causes cervical cancer, and which a new vaccine has stirred controversy. “It’s very clear that this is becoming a major epidemic,” said Dr. Kevin J. Cullen. Launch of the XEROS Dry Mouth Pump. 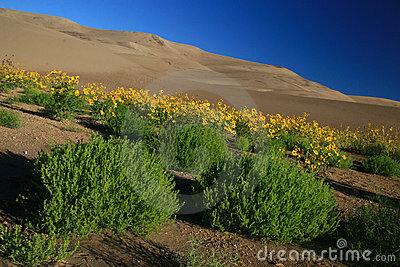 This new product alleviates the debilitation from severe chronic dry mouth. Chronic dry mouth is often a side-effect from radiation therapy to the head, neck, mouth, tongue, jaw, and nose. The XEROS Dry Mouth Pump provides continual hydration throughout the day and night by providing small amounts of liquid to the mouth via a controllable pump for improved hydration, function and health. Aggressive Stretching Techniques to Overcome your Trismus! PNF is a very powerful stretching technique, originally used by Eastern European gymnasts. It utilizes both stretching and mobilizing the surrounding muscles to improve the strength and flexibility of the tight joint. PNF stretching is reviewed by James Scifers in the article "The Truth about PNF Techniques" in Advance magazine.